This Group D game is a clash between two sides who have previously won the Eurocup and they are both in the mix for the trophy this season. The away side have already qualified for the Top 16 and the hosts will be looking to join them by the end of play on Wednesday night. This should be a hugely enjoyable game and there is also the chance for some basketball betting action, making this one of the key games on Wednesday night. Jerusalem knows that a home win will book their spot in the next stage of the tournament and that is all the incentive they need to push on in this game. There is also the fall-back benefit of the Israeli side making progress if Union Olimpija Ljubljana lose again and as they currently hold a 0-5 record, that is not out of the question. 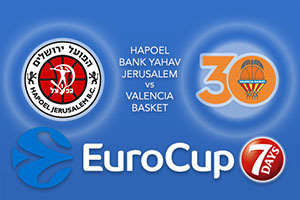 However, given that Hapoel won in Valencia, by a score of 77-81, they will be confident of defeating their Spanish opponents. That previous result means a home win will see Hapoel go top of the league, so there is plenty to play for in this game for the hosts. Curtis Jerrells has been in excellent form, providing an average of 20.3 points for the hosts and if he delivers, the Hapoel fans could be in for a great night. As the Spanish side are already assured of their place in the Top 16, they may not be at their most motivated, but they will want to avenge their earlier loss to Hapoel. There is also the top spot of the table up for grabs and Valencia will not want to relinquish their current position. All of which means this should be an exciting match for any observers in the Eurocup. There has been strength in depth when it comes to points in the Spanish side with Fernando San Emeterio grabbing an average of 11.4 points per game. This is a tough one to call but there are more incentives for the hosts, and you can back Hapoel Bank Yahav Jerusalem at +1.5 which is provided at odds of 1.90. For the Over/Under market, look to go OVER 159.5 at odds of 1.90. Bet Now!